My personal elevator speech when people ask me what I do for a living. "I teach people to do stuff using technology." I've been describing what I do as translating subject-matter expertise into a form most suited to the specified audience, and then applying the appropriate technology to deliver it. This helps describe my "added value" when people think they can have their SMEs hook up with IT and deliver training directly without the middleman. Thanks for 'coming clean' on this one! As a teacher/researcher/academic/e-teacher/instructional designer, I subscribe to what you say about the varieties of ideas that abound about what an instructional designer might be. In many cases (as far as I have met) the 'job' seems to be hinged on what the position is called in the job description. But even the term 'teacher' seems to be a movable feast today. Welcome to the realm of 'instructors'. I feel so bad that I can't adequately explain what I do for a living, when explaining things to people is sort of what I do for a living. Glad to hear someone else out there has the same problem. My best is something like "I create training programs." They can take "programs" to mean a variety of things and it will still be true. Factoid about our job title: It's not listed on Salary.com... the closest I've found is Curriculum Specialist. Boo. 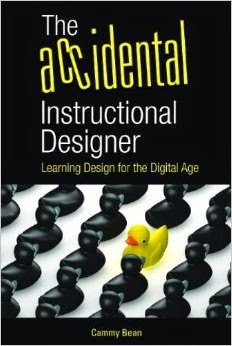 I've started dropping the "instructional design" bit when I tell people what I do. Finally. "I help companies create training." That gets things started in a more comprehendable way. Judy, I haven't looked on those salary sites for awhile, but I remember about 5 years ago struggling to fit my round hole into square pegs on those sites. It was never the perfect match. Thankfully, the eLearning Guild has good salary reports that cover us!